The Northern Education Initiative Plus project has created educational opportunities for more than 36,000 out-of-school children to improve their literacy and numeracy skills. This achievement is inspiring different individuals to donate their own resources to open Non-Formal Learning Centers within their communities reducing barriers to education that stop children from attending formal school in Northern Nigeria. Rehab David, the NGO Capacity Building Officer for the project who works to capacitate community mobilizers to encourage support for education is one of such inspired people. David was inspired as she visited communities and watched children learn to read and write in very informal settings. 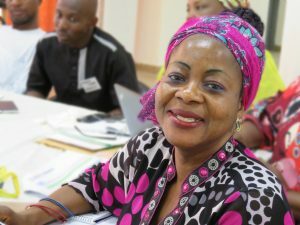 She decided to open a center in her community in Bukuru, Jos South Local Government Area of Plateau State. Children in some parts of this community are from very poor homes and contribute to the family income for their upkeep. Read more of her inspiring story. WHAT INSPIRED YOU TO OPEN THIS LEARNING CENTER IN YOUR COMMUNITY? David: When I saw our intervention at the community level especially our model of opening Non-Formal Learning Centers I was thrilled. I realized you do not need a formal classroom for learning to take place. It can take place anywhere and children can learn. So I was thinking of how I could replicate something similar in my community. But I was daunted by the logistics of it because I reside in Jos but work in Abuja and did not know about getting a teacher or monitoring the center. There is a metal factory near my house and some children learn there as apprentices so one day I asked one of the boys to go and check the time for me and he said he could not. I asked if he could read and he said he could not do that too. It was then it struck me that I could start something there. I asked them if they were interested in classes and they said yes. I sought the permission of the welder who was teaching them and he was open to the idea. I then went to purchase mats, blackboard, reading and writing textbooks and exercise books. I started to think about a teacher when I remembered a friend’s daughter who is very intelligent. I told her about my idea and she was excited to teach these children even before learning she was going to be getting a stipend. We started classes on Saturdays to accommodate some children who go to Islamic school in the evenings during the week. We had classes from 4:00-6:00 pm. Interestingly when I went home recently during the week I saw her carrying mats and she said the children had suggested that since they were on holidays they will like to have classes during the week. She always gives me feedback and says they are learning to read and write. It is like a dream come true. Sometimes the welder sits through the class and has told me the classes are also an opportunity for him to learn. I am even told that when I am not around he is the one that ensures that classes take place. I always believe in giving back to the community. Money is good but it is also important to build values and skills. We started in February, 2017 with five children and I am looking out for more children to join. WHAT DO YOU HOPE WILL BECOME OF WHAT YOU HAVE STARTED? David: I look forward to the day when these children will tell me they have passed their National Common Entrance examinations and proceeded to Secondary School.